The Maine House is a private ocean front sanctuary. Wildlife abounds in this pristine location. See bald eagles fly, seals on the beach, and whales breaching in the bay. Your private beach is reached by a winding path loaded with berries ripe for the picking. Dig for clams, hunt for sea glass and driftwood or just relax. Watch unbelievably beautiful sunrises and sunsets from every room overlooking Passamaquoddy Bay. Located just a short drive (2 minutes) from the heart of Eastport's historic seaport. Come experience the real Maine, a working waterfront with many unique shops, galleries and restaurants. The Breakwater offers deep water fishing from the pier. Eastport is famous for it's festivals: July 4th celebration, the infamous Pirate Festival, Bay Day and the Eastport Salmon Festival. The Tides Institute and Museum showcases the history and culture of the Passamaquoddy region. Culinary options abound. Moose Island Bakery, a coffee shop, delightful candy store and 5 restaurants are just steps away. Fresh lobster can be found at Quoddy Bay Lobster, voted by Yankee Magazine as having the best lobster roll in New England. Whale watching and fishing expeditions are available in town. Enjoy the concerts of Summer Keys. Hiking and kayaking options are plentiful. 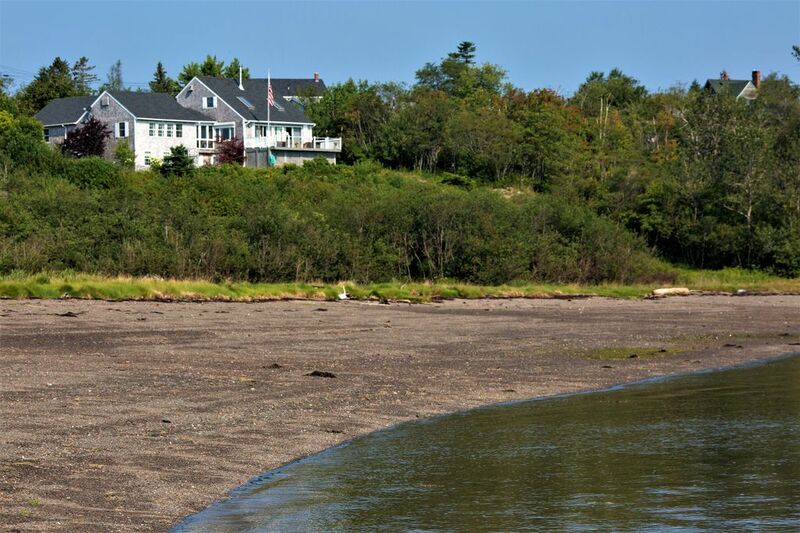 This charming home has been lovingly renovated from top to bottom to maximize unobstructed water views of Passamaquoddy Bay, Campobello Island and the Canadian Maritime Islands from every room. Outdoor living features dining for 8, seats for relaxing and a beach front fire pit ... great for those chilly Downeast nights. Eastport is known for spectacular sunrises that you will wake to from the comfort of your bedroom. The sumptuous master bedroom and bath are located on the main floor with unparalleled views of the ocean. Two additional bedrooms and baths offer privacy. A designated office and high speed DSL enables office check ins when work won’t wait. This is truly your home away from home. I grew up in Maryland and our family drove to Maine every summer for vacation. Time spent there made for the best memories. I recently bought the house from my parents to keep it in the family. My parents purchased the land in the 70s and then my dad built the house and crafted every cabinet inside. A labor of love that we would like to share with you. The views are spectacular showcasing both sunrise and sunset. The bay has 25 foot tides- watch the amazing change from low to high tide, right from the house. Walking the beach and climbing the rocks has always been my favorite pastime while visiting. Path from house downhill to the beach. Dig for clams, search for seashells and sea urchin shells and sea glass. Have a beach bonfire in the evening - or a clambake! 5 acres on Passamaquoddy Bay, overlooking Deer Island and Campobello Island, Canada. Beautiful views from every room in the house. Watch the tide as it rises and falls about every 6 hours. The house has a great layout for family and friends. Comfortable furniture and bedding, ocean porch for entertaining and a sky full of stars. You won’t be disappointed! From the moment I found this home through several interactions with it's owner, to the incredible week we spent in this home to the thoughtful post-stay contact with the owner, our experience was simply amazing. The home is gorgeous - beautifully decorated and with everyone you could want or need available. We are from southern Maine and rented this home for our honeymoon. Owner Mary left us a lovely note, fresh cut flowers from the garden, and a lovely bottle of wine in the fridge. There really is no other place on earth like downeast Maine and Mary's wonderful "Maine Home" is gorgeous and incredibly comfortable. We've already talked about returning for our first anniversary. If you rent this home, you won't be disappointed. If you stay in this home, you will fall in love! We stayed in the Maine house for a week at the end of August with four adults and 2 children. The house is beautiful, well cared for and stocked with everything guests might need. The water view from the back deck never gets old and we were able to spot bald eagles and seals in the cove. My two boys loved exploring the beach every day, hunting for crabs, urchins and other sea treasures. We also enjoyed exploring downtown Eastport as well as Lubec, Campobello Island and St. Stephen-by-the-sea. The spectacular scenery and the chance to spot whales in the bay captivated us all. We truly enjoyed our week at this lovely home and were sad to leave. Our family of four had a wonderful week stay at this beautiful home. This is our 5th year vacationing in Eastport and by far this has been our favorite house. We were able to see bald eagles, whales and seals from the back porch! And the private beach was wonderful. One day we dug for clams on the beach and had them that night with our dinner - they were wonderful! The house is fully updated, and there is beautiful view of the water from practically every room! There is even a wood burning stove for those cold Maine summer nights. Can't wait to return! A beautiful property and beautiful house, it makes a stay in Eastport elegant and easy. Eastport can seem remote and away from it all, but this house makes it seem like home. The lovely and well equipped kitchen flows via wood floors and walls into a front room with a full view of the bay to the shores of New Brunswick. The large bedroom has a similar view -- both space with lots of glass and windows. The master bedroom and bath are up to date, roomy, and welcoming. The two upstairs bedrooms and bath have plenty of space, too. The grounds are well kept, the gardens have a nice variety of plants, and the property itself has its own path (with blueberry and raspberry bushes) to the beach with its extraordinary and compelling 30 foot tides. We saw eagles, grey herons and other sea birds. The internet works quite well throughout the house, too, and essentials like laundry room, detergents, bug spray for hiking, bikes, tools -- the works! -- are all there and easily found. Special praise goes to the owner, who is thoroughly gracious, generous, down to earth, and quick to respond to any questions. Eastport is a one-of-kind Maine experience, and staying at this house is the way to do it. This property is just so beautiful and relaxing. The views of the ocean are amazing. The house has all the amenities of a luxury hotel. We enjoyed walking down to the beach at low tide. It was so much fun to walk so far out and unbelievable how high the tide gets. It's close to many of the Maine's eastern most attractions and close to beautiful New Brunswick. We highly recommend this location to anyone who wants to visit eastern Maine or just to sit on the deck and relax overlooking the ocean. If we ever go back to Maine, we will reserve this house again. Thank you to our host for making our trip to Eastport unforgettable. Whale watching, annual Salmon Festival, Pirate Festival and nearby Blueberry Festival and Indian Days.